When planning a site in Adobe Muse, I think we all like to give our pages nice short names; Home, About, Contact, etc. This shorthand page titling comes to be sort of a problem on the search engine and bookmarking side of things. Plus it just doesn't look quite right to look at the top of a web page in your browser and see nothing but the word "Home". This is why we brand our page titles. Though most will do this by typing out, or copying and pasting the name of their website into each and every page title of their website "Plan". Well no longer! Open up your primary Master page that you have build your other pages from and navigate to Page > Page Properties... then click the Metadata tab at the top. This reveals two text fields; Page Title Prefix and Page Title Suffix. 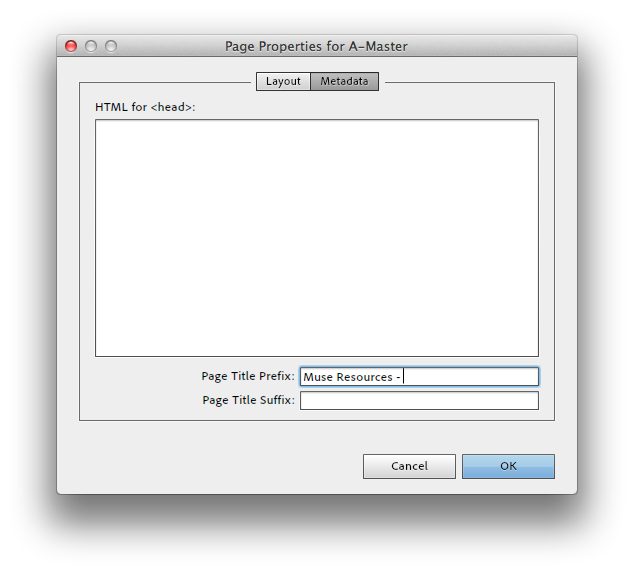 Type your site name into the Page Title Prefix box and Muse will automatically add what you've typed to the beginning of every page based on this master. Use Page Title Suffix to have it added to the end of the page name instead. Or use both if you'd like. ie: Muse Resources - Home - Entirely Free Design Resources for Adobe Muse. Don't for get to include spaces and separators (if you'd like) to make sure the prefix, page name, and suffix don't collide.